Recently, Kurt Cooper (aka Coop), a member of the Khayamandi Foundation Board of Directors, and a team of 15 American volunteers visited Knysna as part of their annual Missionary Outreach. This was their second visit to the townships of Knysna and was a collaborative effort between Khayamandi and Warren Baptist Church, Augusta, GA.
During their first trip to Knysna in November 2014, a team of 15 American volunteers and 15 local guys constructed a stand-alone Sunday school classroom on a property near “My Father’s House Baptist Church” in Boghani township. During the week, mutual friends, Dawn and Penny, introduced Koop to Philip from YFC Knysna for the specific purpose of partnering to assist a young & promising student of the Hands & Heart Skills Development Centre, Denolin Appels. Not only did Khayamandi help realise Denolin’s dream of continued technical education but after completing their building project, they donated all their tools to YFC Knysna and just asked that they be allowed to borrow them back when they returned a year later for their second construction project. Subsequently, the Khayamandi Foundation provided funding for two positions at Hands & Heart and YFC hired Dennis and Denolin (father and son) to fill those positions. 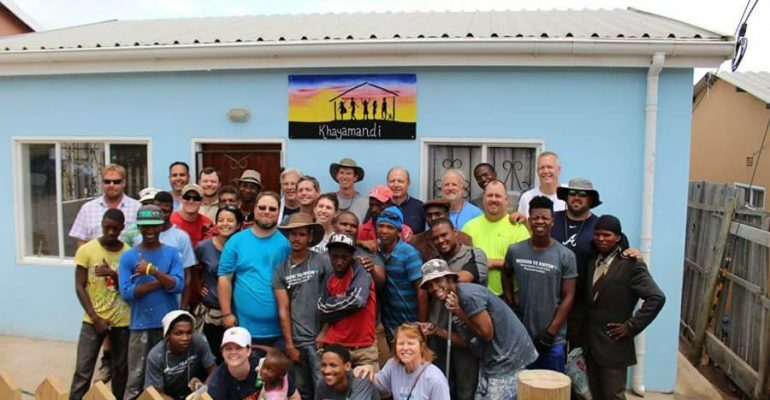 In January 2016, Khayamandi returned for their second construction mission trip which was to finish an expansion one of the Lukhanyiso Safe Houses. They financed and constructed four bedrooms, two additional bathrooms/showers and a kitchen. Once again they had a team of 15 American volunteers and an additional 28 local guys were hired along with supervision from a local contractor. Several of the local men hired for the week were graduates from Hands & Heart and two other young men enrolled with Hands & Heart directly after finishing the project with Khayamandi. As requested, Khayamandi borrowed the tools previously donated to YFC and used them for the week along with a batch of new tools and extra batteries that they brought from the United States. Those new tools and batteries were also donated at the end of the week to YFC Knysna. The Khayamandi Foundation will be returning in January of 2017 and are now planning just what the project will be. They have been in discussions with Phillip and Garald to finalise an even greater partnership next year with the possibly of having all the Hands and Heart students participate and get a bit of real world construction experience.